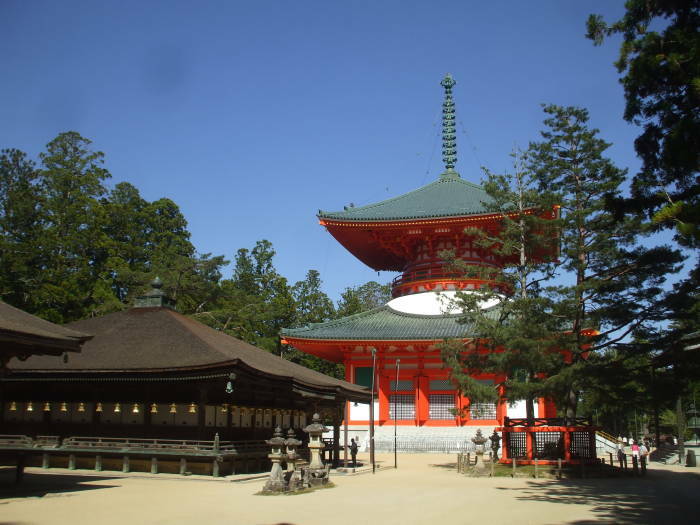 Danjogaran, sometimes called just Garan, is the main temple and shrine complex at Kōya-san. 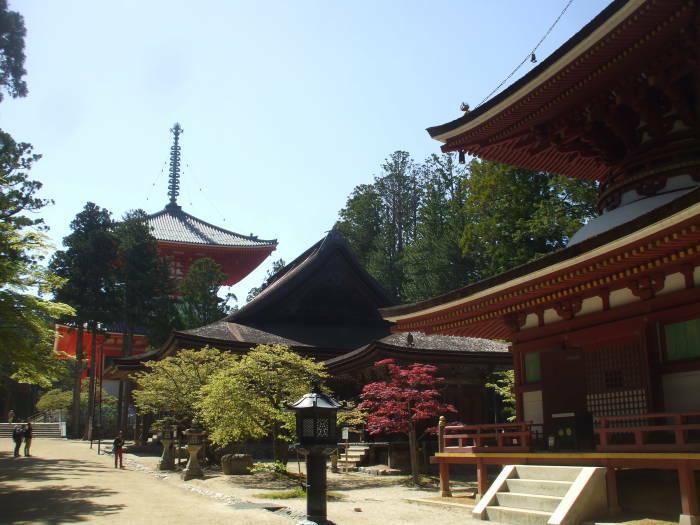 There are about twenty buildings in the complex, most of them Buddhist temples or pagodas but also a few Shintō shrines. Garan comes from the Sanskrit Samgharama, meaning a quiet and secluded place for Buddhist monks to gather and study. 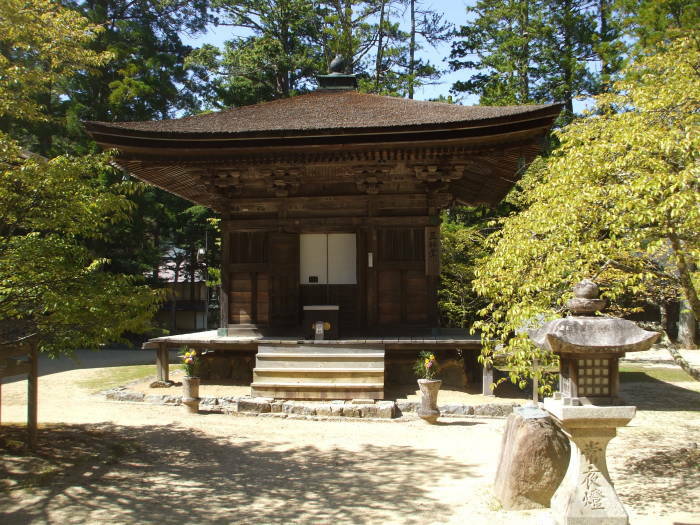 The Kondo, the main temple hall, was first built in 819. It contains a large statue of Yakushi-nyorai the Medicine Buddha. This figure, Bhaiṣajyaguru in Sanskrit, more formally Bhaiṣajya-guru-vaiḍūrya-prabhā-rāja, the King of Medicine Master and Lapis Lazuli Light, is the Buddha of healing and medicine. The Miedo, the Temple of Portraits, contains a portait of Kūkai that is hidden through the year, shown only on March 21st, his birthday. 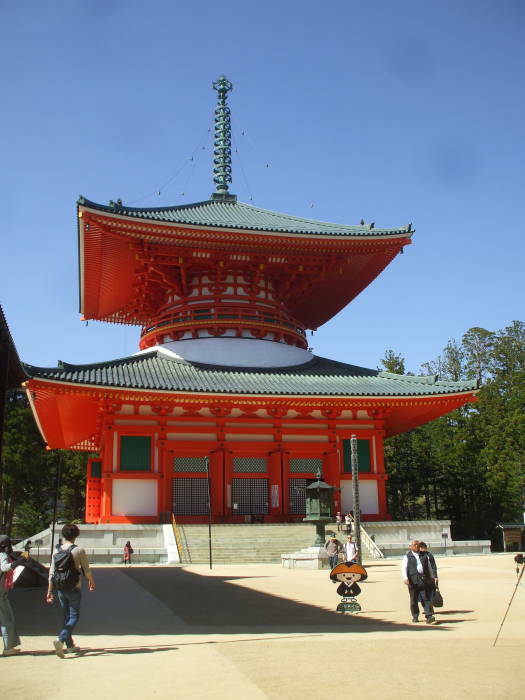 The Konpon Daitō is a pagoda that, according to Shingon doctrine, embodies a mandala encompassing all of Japan. 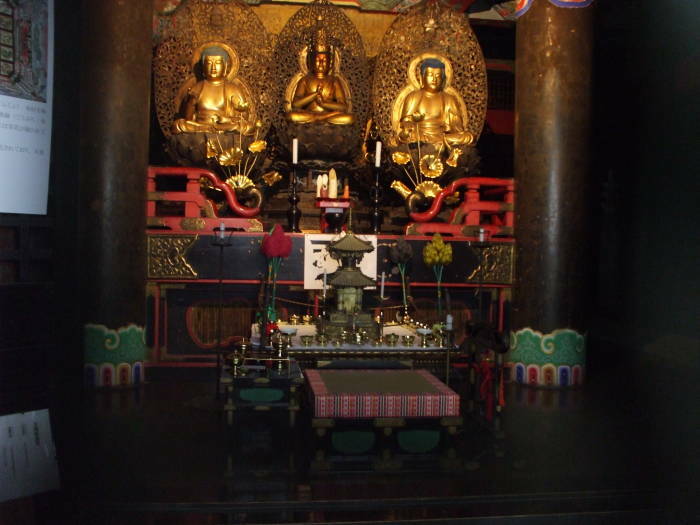 It contains the Dainichi Nyorai, the Cosmic Buddha, surrounded four other assistant Buddhas. 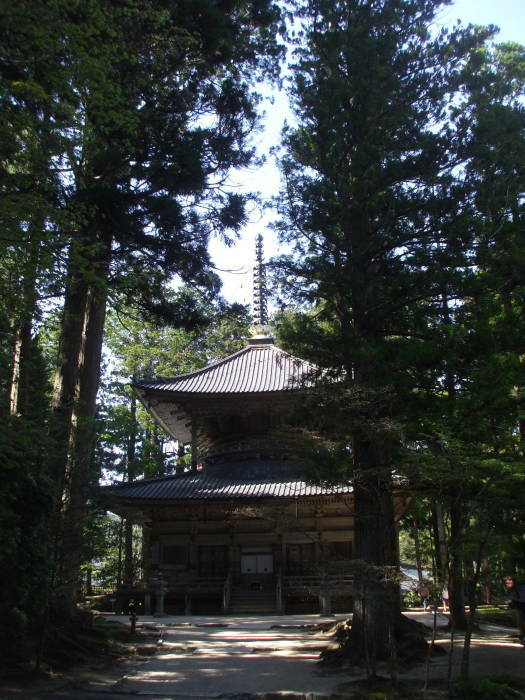 The original Konpon Daitō was built in 816, the first year of construction at Kōya-san. However, pagodas have not lasted well here. These pagodas are tall wooden structures topped with metallic spires and built at high elevation. Until lightning rods were developed in the 1700s, pagodas were frequently destroyed by fires started by lightning. This one has been destroyed and rebuilt five times. What you see today was rebuilt in the 1930s, and this time the main structure of the pagoda was made from concrete and covered with wood panels. 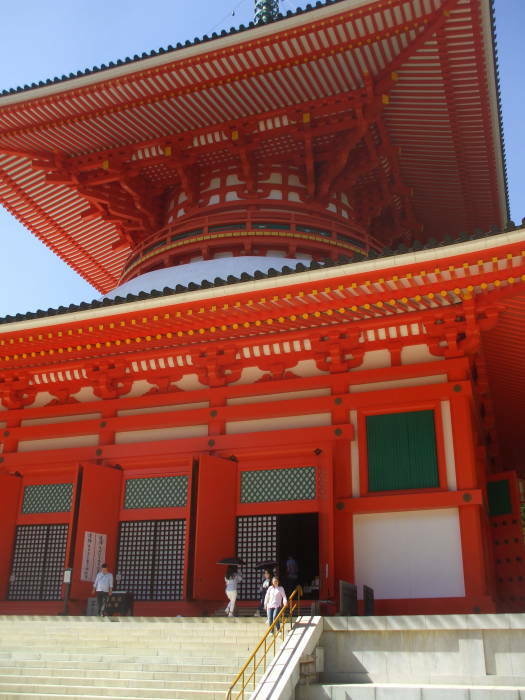 The Konpon Daitō is about 50 meters tall and 25 meters wide. It contains a large statue of Mahāvairocana of the Matrix Realm surrounded by the Four Buddhas of the Diamond Realm, surrounded in turn by paintings of the Sixteen Great Bodhisattvas painted on columns. At the corners of the walls are paintings of the eight patriarchs of the Shingon Buddhist lineage. The Reihokan Museum is nearby. I visited it toward the end of my visit, which worked out well as I had only then learned the details of some of what I saw there. The most significant things to see are the two large mandalas, diagrams used as spiritual and ritual symbols representing the universe. The Dainichi-kyo and the Kongocho-gyo, the Mahāvairocana Sūtra and the Vajraśekhara Sūtra in the original Sanskrit, are the two primary texts of Shingon Buddhism. They are the basis of two mandalas. The Taizo Mandala or the Mandala of the Womb World embodies "That which is to be realized — the Principle". In western philosophical terms: Ontology. The Kongokai Mandala or the Mandala of the Diamond World embodies "That which realizes — the Wisdom". In western philosophical terms: Epistemology. Kūkai taught, "The Principle is nothing but the Wisdom, while the Wisdom is nothing but the Principle." That is, Ontology and Epistemology lead us the same way: to the Truth. 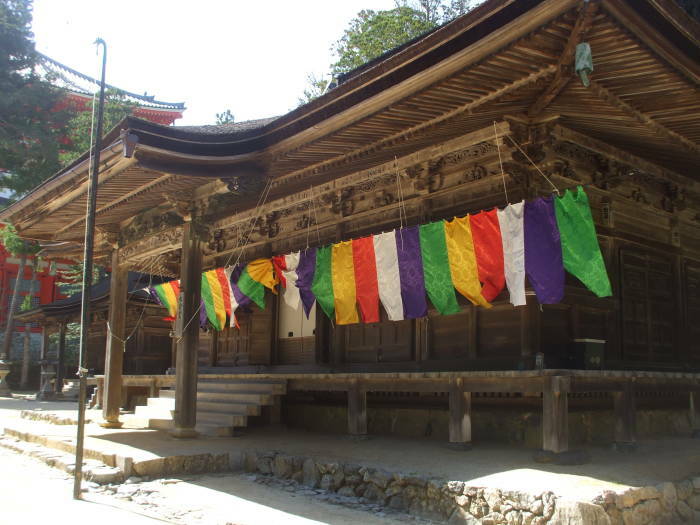 Good luck wrapping your head around this in one short visit to Kōya-san! But there are some good explanations in the museum along with early versions of large hanging mandalas.